Laser skin spot removal is performed by dermatologist, Dr. Phyllis Smith for patients in our Huntington, Long Island, NY office using advanced medical lasers that remove these distractions safely, easily and effectively. 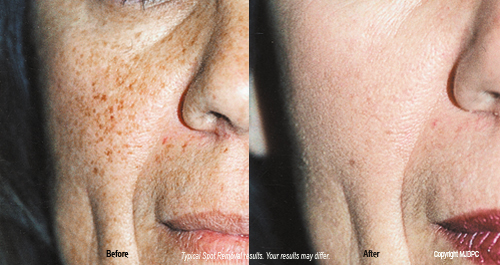 While spots and freckles may not be medical emergencies, many of our patients would like to have them removed. Your face, hands and arms are the first parts of the body to show signs of aging because they receive so much exposure. Sunlight, the elements and the natural aging process all contribute to the development of dark spots and freckles. Age spots and freckles are forms of pigmented lesions. They are caused by excess production of melanin in the skin. Melanocytes are the cells that manufacture melanin (the dark pigment in skin). Most of us have some form of pigmented lesion. 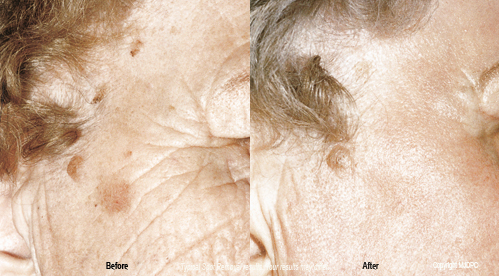 Today, lasers can remove 90 – 95% of the pigmented lesions effectively. Lasers and advanced light systems convert electrical energy into intense light. Different systems produce different colors (wavelengths) of light. Each color light is used to treat specific tissues. For example, the light which is used to treat lesions is brown and will not have any effect on other colored tissues. Will Laser Spot Removal work for me? During the consultation with our physician, explain your goals and expectations of the treatment. Our doctor will assess the nature of your skin lesions, your expectations and explain the probable outcome of each procedure. You may be shown several before and after treatment photographs of patients with similar spots, and our doctor will explain the procedure you can expect to receive and the results that you can anticipate. Most patients describe the sensation to feel like the snap of a rubber band on the skin as the laser pulses are delivered through the handpiece. Some patients request a topical anesthesia for added comfort. Following treatment, the pain is minimal to nonexistent. How many Laser Spot Removal treatments will I need? Typically only 2-3 treatments are all that is necessary. Occasionally darker, larger spots may require additional treatment to obtain optimal results. How long do Laser Spot Removal treatments take? Depending on the number, size, and location of the lesions, treatments usually take only a few minutes. Will the spots return after laser treatment? Not usually. However, new spots may appear over time, but these too can be removed. Optimal results can be maintained only if you apply sunscreen on the treated area and avoid future sun exposure. Are Laser Spot Removal treatments safe? Yes. Lasers and advanced light systems have been used safely on millions of patients of all ages worldwide. These systems treat only the targeted lesions (spots), leaving the surrounding tissue intact. There are many benefits to laser surgery including little if any pain, no needles for most patients, less bruising and swelling and once removed, lesions rarely return. The risk of scarring or discoloration is minimal. Laser Spot Removal gives our doctor precise control as the procedure gently removes the spots to reveal smooth, fresher-looking skin. The laser’s energy is delivered in pulses via a handpiece held very close to the skin. As the laser pulses, you may feel a slight sting. If needed, a local anesthetic can be applied to the treatment area. Spots are removed in a precise, rapid, bloodless fashion achieving excellent results. How will I feel after Laser Spot Removal treatment? After Dr. Smith performs your laser treatment, there may be a little discoloration. After several days a crust will form and fall off within 7 – 14 days. Occasionally some discoloration may persist for several months.